For fans of Robin Sloan's Mr. Penumbra's 24-Hour Bookstore and Maria Semple's Where'd You Go, Bernadette, an inventive, brilliant debut novel about the disappearance of a famous Brazilian novelist and the young translator who turns her life upside down to follow her author's trail. Beatriz Yagoda was once one of Brazil's most celebrated authors. At the age of sixty, she is mostly forgotten-until one summer afternoon when she enters a park in Rio de Janeiro, climbs into an almond tree, and disappears. When her devoted translator Emma hears the news in wintry Pittsburgh, she flies to the sticky heat of Rio. There she joins the author's son and daughter to solve the mystery of Yagoda's disappearance and satisfy the demands of the colorful characters left in her wake, including a loan shark with a debt to collect and the washed-up editor who launched Yagoda's career. What they discover is how much of her they never knew. Exquisitely imagined and as profound as it is suspenseful, Ways to Disappear is at once a thrilling story of intrigue and a radiant novel of self-reckoning. Idra Novey is an award-winning poet and translator. Born in western Pennsylvania, she has since lived in Chile, Brazil, and New York. The author of Exit, Civilian, selected for the 2011 National Poetry Series, Novey's poetry and fiction have been featured on NPR's All Things Considered, and in Slate, StoryQuarterly, The Paris Review, and Guernica. She currently teaches in the Creative Writing Program at Princeton University. "Idra Novey, an acclaimed poet and translator of Spanish and Portugese literature, has written a debut novel that's a fast-paced, beguilingly playful, noirish literary mystery with a translator at its center. Ways to Disappear explores the meaning behind a writer's words--the way they can both hide and reveal deep truths....Novey's novel delivers on its promises in so many ways. Yes, there's carnage, but there's also exuberant love, revelations of long-buried, unhappy secrets, ruminations about what makes a satisfying life, a publisher's regrets about moral compromises in both his work and his use of his family wealth and connections, and an alternately heartfelt and wry portrait of the satisfactions and anxieties of the generally underappreciated art of translation....Ways to Disappear is concerned not just with truth and the risks of its misplacement and misinterpretation, but with the importance of close reading. It's a delightful, inventive paean to writing that generates 'real emotion' and 'genuine unease.' At one point Beatriz's publisher likens literature to steaks on a grill, testing both 'for density' as well as 'for something tender in the middle yet still heavy enough to blacken the air.' This book is seared to perfection." "Exhilarating....Sly, lovely writing.... In Raquel, Beatriz's hard-bitten daughter, [Novey] has created a heart-rending portrait of the price someone always ends up paying for genius. A writer to watch." "Novey is astute, funny, and cunning in this story, which even in its brevity covers so much lush ground." "(A) wholly original, wickedly fun debut novel." "An experimental page-turner...a canny mystery." "This amazing first novel is unlike any other you've ever read. Ways to Disappear is a lush page-turner, a journey into the unique madness of modern Brazil, and a joyful ride into the crazed passion of literary creation itself. Idra Novey is a wonder of a writer." "Idra Novey is an enchantress. Her sentences are so surprising and beautiful, her vision of the world so kaleidoscopic, that I fell immediately and permanently under the spell of this glorious novel." "With all its shimmering brilliance and insight, vividly drawn and beguiling characters, and unabashed storytelling, Ways to Disappear is the most sublime novel I've read in a long time." "A fast-paced, supremely engaging story of characters with good intentions who quickly get in over their heads . . . Novey's characters are hilariously impulsive, terribly misguided, hopelessly lost, relentlessly determined, and immediately sympathetic. An incisive meditation on the relationship between literature and life, a reflection on the cumulative result of everyday decisions, and a dazzling, truly memorable work of humor and heart." "Idra Novey's debut novel cast me under its spell from the opening scene....Ways to Disappear reads like a thriller and scores thematically on the missteps of translation and the untenable distances of the heart." "Written in short poetic chapters and punctuated with dictionary definitions, Ways to Disappear is both a meditation on the art of translation and a classic mystery complete with loan sharks, amateur detectives, and an ill-advised romance." "Fast-paced and colorful, Ways to Disappear is part mystery, part romance, but 100% a delight." "Poet and translator Idra Novey brings a considerable imagination to her first work of fiction....Stylish and funny, romantic and surreal, Ways to Disappear is a quirky look at the intimate relationship between author and translator....Though Ways to Disappear unfolds at the rapid pace of a screwball comedy, there is also something patient and artful about the novel, making it a thoughtful treatise on writing and artmaking that is as profound as it is playful." "Novey has a knack for engaging, humorous prose and audacious plotting the likes of which are rarely seen in a first novel." "The plot is filled with twists and surprises, and Idra Novey makes it come alive with prose that is both magical and lyrical....Novey has a style all her own....She is a singular voice who impressively has spun a story into a thrilling ride for her characters and readers alike." "A gorgeously written, truly fun literary mystery....with madcap humor and keen insights into the craziness of family dynamics." "Novey writes with tremendous insight and a wistful appreciation for the elusive nature of language....With lean, incisive prose Novey delivers a bright, unpredictable novel that is both playful and vulnerable. It is an adventurous mystery set in a tropical paradise that is sure to leave you breathless." "Humor, poignancy, passion, and a bit of magic are all elements of this delightful debut novel. Novey's tightly drawn, superbly funny tale offers not only glimpses into modern Brazilian life and culture but also insights into the creative process of authors and translators. A quick read, largely because it is hard to put down." "A supercharged and perfectly-timed novel." "A fun, fast-paced romp....with poignant themes of belonging and identity." "The novel's success lies in....its reflections on the mysteries and delights of translation and interpretation." "A novel that will leave you in a glow....Novey's debut has a warmth and humor all her own." "You can disappear for hours in Novey's original story." "Ways to Disappear is a thoughtful tropical noir with depth and feeling...full of gorgeously rendered action...the best lines feel like joyful ambushes." "Using her poet's -- and translator's -- precision, Novey seeds her story with crystalline images, like perfect little dioramas through which her characters move... Novey has crafted a delightfully metafictional and metatranslational exploration into the creation and appreciation of literature." 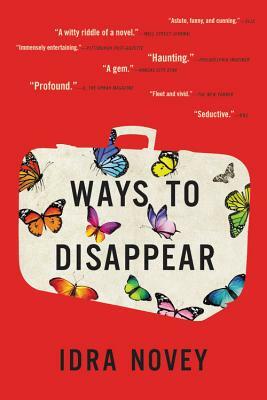 "Love, family, and death-Idra Novey's debut, Ways to Disappear, has it all...a worthy, captivating storyline that is less about writing than it is about the ways in which people misunderstand one another-caught in the grip of opposing desires to be seen and to run away." "Novey writes with tremendous insight and a wistful appreciation for the elusive nature of language... With lean, incisive prose, Novey delivers a bright, unpredictable mystery that is both playful and vulnerable."